Jews from Israel, Europe and America, Muslims from Iran & Turkey, Buddhists from Taiwan and mainland China, Hindus from South Africa and elsewhere and Parsis from the United Kingdom join Christian carollers to hail the birth of Mary’s blessed baby, born in a manger 2000 years ago, making Christmas in Prasanthi Nilayam a global celebration. 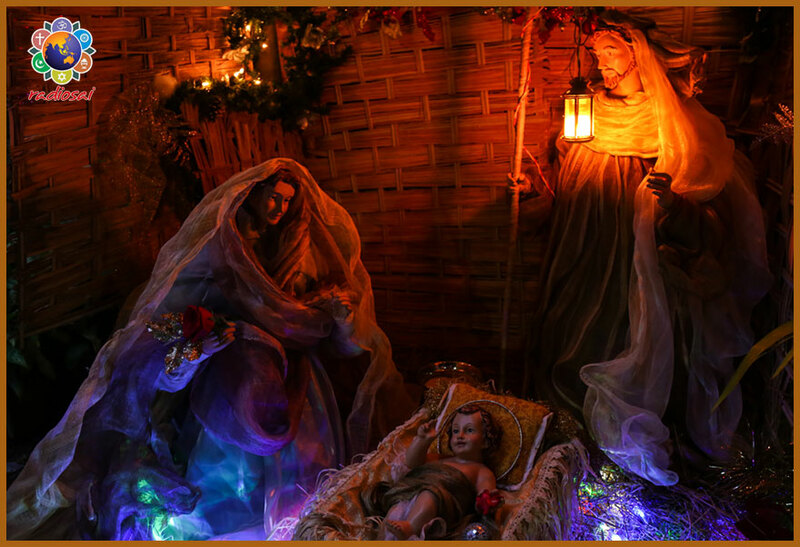 In the true spirit of the Christian tradition, the Prasanthi Christmas is focussed on the birth and life of Jesus the Christ, the beloved son of God, and his teachings of love and forgiveness. Untainted by commercialism, partying, secret Santa and gift exchanging associated with this season, in the abode of supreme peace, Christmas has an angelic resonance. It is infused with an organic spirit of joy that permeates the entire ecosystem of the ashram. What makes this celebration all-inclusive is that Christians from all over the world, speaking different languages, descend upon the divine valley to celebrate the most sacred day in the Christian calendar in the divine presence of the Poorna Avatar, Bhagawan Sri Sathya Sai Baba. They are joined by seekers from every possible faith who share the spirit of the season, resonating Bhagawan Baba’s call that there is only one religion, the religion of love. A Hindu sanyasi decorating the arch around the image of Lord Jesus with the same love and devotion as he has for Lord Krishna is a common feature of Prasanthi Christmas. 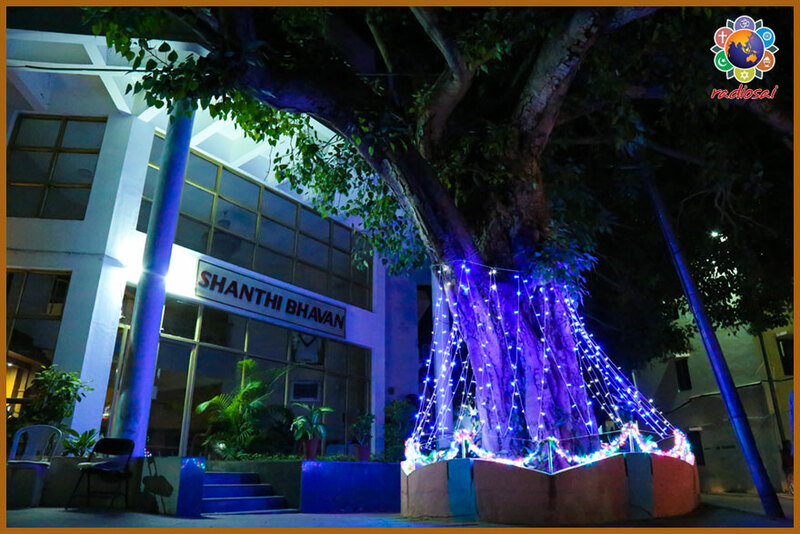 Love also happens to be the theme of Christmas 2016 in the ashram this year with the four letters L-O-V-E reminding us of the need for Living Our Values Everyday. The same theme is the binding energy that has brought together a potpourri of Baba’s global devotees to join hands and work in unity and with efficiency, thereby transforming the ashram into a heaven resonating the deep, soulful peace and inner joy associated with the sacred celebrations. From the main Gopuram gates leading to the ashram, as well as the Ganesha gate, to every niche and prayer nook, the entire ashram is decorated in the red, green, white, gold and silver colour scheme, with beautifully decorated Christmas trees, wreaths, holly and poinsettias. Images of Angels hover over the first floor verandah above the Maha sannidhi and biblical scenes are displayed artistically in the Sai Kulwant Hall. From Lord Ganesha, to Lord Subramanya, to Lord Jesus, the Ram Darbar at the foot of the Sai Kulwant Hall, the Snake deities across from Ganesha, Goddess Gayathri and Goddess Lakshmi... everyone in Prasanthi Nilayam is celebrating Christmas. The main sanctum, the Sai Kulwant Hall is a heavenly sight to behold with rich decorations reminding the thousands gathered of Jesus’ message of Love. Even the massive Christmas chandeliers in the Sai Kulwant Hall carry the message - Living Our Values Everyday (LOVE), as do the drapes on the pillars. 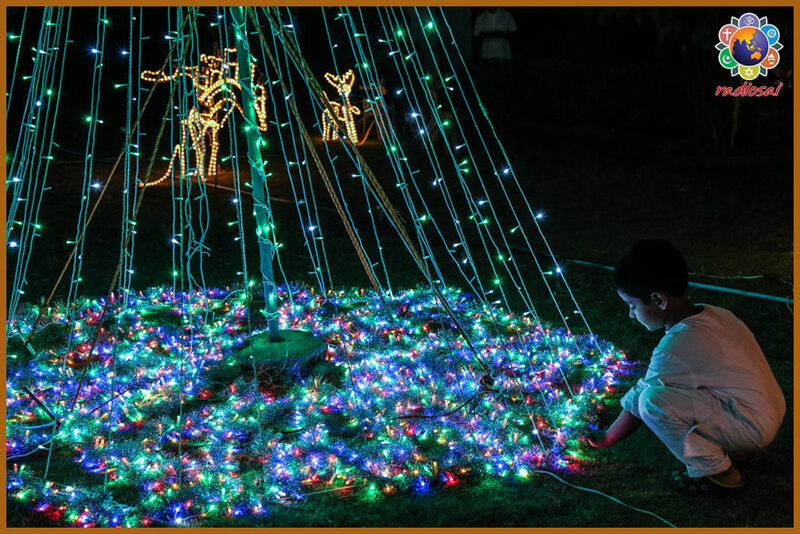 In the days leading to Christmas, each morning the ashram wakes up to more beautiful reminders of Christmas, be it the nativity scene by the Western canteen or the big wreaths and richly decorated Christmas trees outside Yajur Mandir. In the abode of Bhagawan Baba, the entire task of bringing alive the spirit of Christmas through sights, sounds and love is shouldered personally by teams of dedicated Sai devotees. No professional event management crews are ever hired for this festival. Traditionally, at the end of each year’s celebrations, a country is nominated for the following year’s Christmas decorations. That is how countries such as South Africa, Australia, New Zealand and the United Kingdom have taken the lead in the past few years. This year however, the team comprises of a group of global volunteers led by South Africa. This international group had to overcome many challenges including language barriers, as a sizeable contingent of volunteers are Russian-speaking while the English-speaking South African team is leading the design and project management. Given his extensive experience from 2010, South Africa’s Mr. Soobramoney Naidu (Soobrie) is leading this year’s global team’s massive operation. 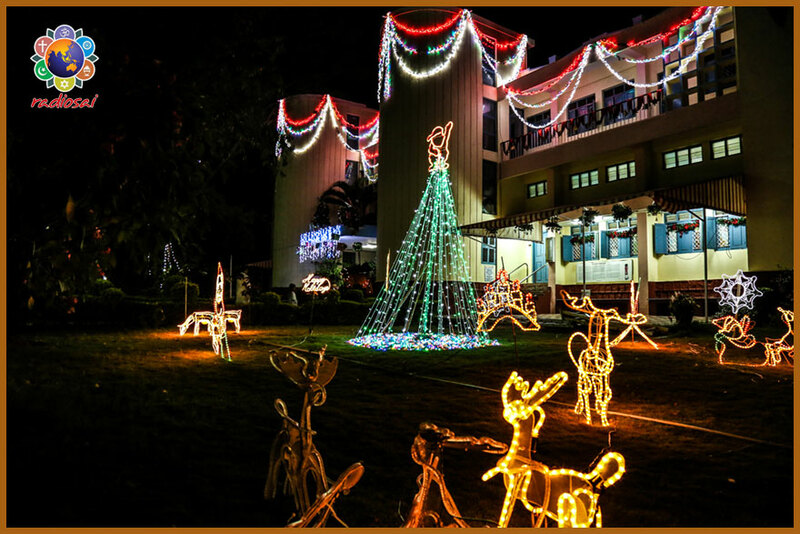 To ensure the success of Christmas decorations 2016, Mr. Soobrie knew that the best way to overcome cultural and linguistic barriers was by falling back on the universal language that unites the Sai mission across India and 121 countries globally - the language of the heart. Right at the outset, he requested the entire team, comprising of various nationalities of the need to pour love into every thought, word and action connected with Christmas decorations. Thus the project became the testing ground for Living Our Values Everyday, or LOVE, the theme of this year’s celebrations. Like every year, this year too, the Christmas group experienced the hidden hand of God in their efforts. When they were short of help, a crew of disciplined and dedicated Russians showed up and worked in harmony and unity. A few years ago, when at the last moment, the airline in South Africa refused to ship the containers with Christmas decorations for Prasanthi Nilayam, the team was able to quickly resize the containers as per the airline specifications and to their surprise, all the contents fitted perfectly in the reduced sized cartons, although they were filled to the brim in the earlier containers! A mysterious force appeared to have shrunk the volume of the contents. Again in the year 2010, when the crew from South Africa was decorating the area outside Bhagawan’s residence, the Yajur Mandir, they wanted to place some beautiful but heavy pots on His first floor balcony. The operation had to be conducted as quietly as possible, and from outside, without disturbing Bhagawan who was in residence. The volunteers were finding it very hard to lift heavy pots on unstable ladders. That is when the compassionate Lord sent a person from inside to advise them that their effort was too risky, and assured them that the needful would be done for them by 10 AM next morning and it was! This annual spiritual exercise involves various stages of development, from concept to design, materials procurement, execution, putting it all up and finally taking it down and storing it carefully for use in the future. The motivation to sacrifice their annual vacation and toil long hours for the glory of the son of God comes purely from within and every participant has a unique story to share. If the spectacle of love transports us to heights of bliss, it is the melodious choir that draws the world to Christmas celebrations à la Prasanthi Nilayam. Every year, the International Choir, and the Children’s Choir resonate melody, harmony and spiritual love befitting the celebrations. Musicians and singers from around the world come in and pool their talents under the guidance of proficient conductors. Although planning starts much earlier, the rigorous practice sessions begin by mid December every year and involve hundreds of musicians who would rather avail of this opportunity to perform in the mandir than be anywhere else in the world. This year, Dr. Tatyana Goldberg of the United Kingdom is leading the music which is a combination of the old classics as well as some new Christmas music. Despite the ethnic and linguistic diversity of the singers and musicians, their love for Jesus and Bhagawan Baba unites them all into a multicultural mosaic. On this Christmas day, we can only bow in gratitude to our Lord, who allows us in all His love and compassion to celebrate this holy day, year after year, in His very presence, in the true spirit of Christmas. We, members of Team Radio Sai, wish each of you a happy and holy Christmas!